A powerlock box is an electrical connection point that enable emergency power to be quickly and safely connected in the event of failure of the mains supply. The sequential power distribution box allows earth and neutral lines to be connected to circuits before the electrical live lines. Therefore the powerlock box is considered to be one of the safest means of connecting three phase electricity. Phase 3 manufacture the Powersafe powerlock box. The electrical distribution box mates with standard Powersafe single pole connectors. with all ports keyed and colour coded for sequential mating, therefore ensuring ground is connected as ‘first mate last break‘ (FMLB). In addition, as a safety measure for electrical power professionals, the power distro box has IP2X finger-proof protection. The Powersafe Box is available in lidded and un-lidded versions, which gives the device IP67 protection when closed. The box has an extended front panel which provides a seal around the whole box, whilst the non-lidded version is only sealed when mated. Connector ports are environmentally sealed to IP67, as a result it is suitable for outdoor applications such as mobile generators and military operations. Connections are safe: Earth and Neutral connections must be connected first. Live lines 1 to 3 cannot be mated in the wrong order due to the innovative sequential mating mechanism. 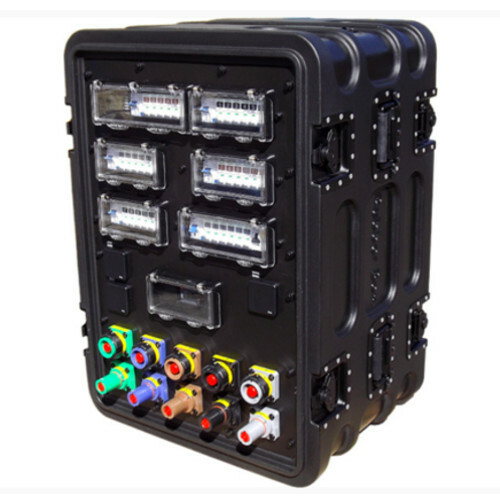 The distribution box is also IP67 rated when mated, allowing a waterproof connection. A special locking key is required to plug or unplug all connectors, therefore only authorised persons in possession of the key can connect and disconnect the Powersafe Box. Easy Install: The panel connectors are mounted in a single enclosure. There is no need to fabricate flange holes for five individual panel mounts. Insulated: Some electrical regulations required hardware to be made of non-conducting materials. The device is insulated, giving greater freedom in fastener specification. Materials used in manufacturing are heavy duty flame retardant thermoplastics. Intelligent Technology: A remote control function can be configured via the rear-mounted connector to disconnect the power should someone try to unlock the box. Harsh Environment Application: An optional lid can be used as a protective cover that is built in and forms part of the mating sequence. As a result, IP65 protection is listed for the un-mated box. When the connectors are installed the box is rated IP67 – or environmental caps can be used for IP67 protection. Phase 3’s electrical distribution board is obtainable in two rated versions, 500 amp and 800 amp. The product is also available with both source and drain ports available. Phase 3’s portable electrical box comes in two panel sizes, 88mm and 108mm. As a result, the distro box perfect for event professionals because it only uses 2U of rack space in a 19 inch rack or 4U for panel mounting in its 108mm form. The Powersafe box can be panel-mounted, providing the most cost-effective solution, or brought out to an external or safe position. Large power connections can be catered for by stacking the units allowing for even the largest of low-voltage supplies to be connected in a safe way. 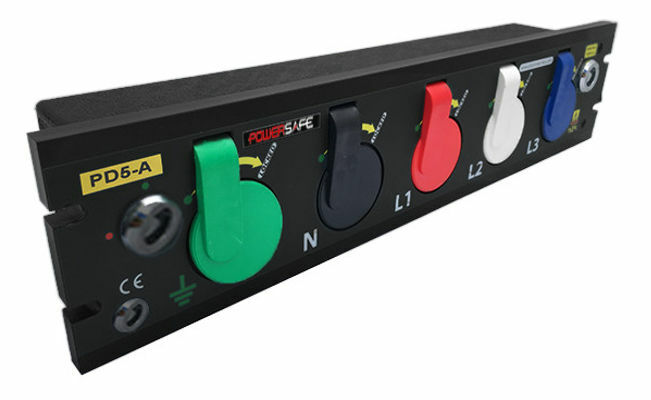 The box utilises standard Powersafe Connectors in either drain or source format. The AC/DC device’s ports are lockable to prevent accidental disconnections and colour coded to suit international wiring colour standards. The Powersafe Sequential Mating Box can operate with an internal micro-switch that can be used as a signal path to operate electrical protection devices. A 3 pin connector on the rear of the box is provided for easy connection. The micro-switch can be used to trip the mains supply should someone open the lock key whilst the supply is present. The Powersafe powerlock box is often used in environments like Nuclear Power Plants, as the need for backup power supply is imperative. Security is assured for installations accessible to the public, for example, in hospitals, factories, shops and offices. How does the powerlock box work? Operation of the Powersafe device incorporates an integral shutter mechanism which controls the connection sequence on the electrical panel board for single or three phase circuits. Earth – Turn safety key to open the Earth port to allow connection of the Earth connector. Neutral – Plug the Earth connector into the powerlock box and turn clockwise to its locked position. The Neutral cap will now open to allow you to plug the Neutral connector in. L1 – L2 -L3 – Continue the process with L1 and L2, finally plug in the L3 connector. Once complete, turn the safety lock key to the closed position (this will lock all the connectors mechanically in place and signal the internal micro-switch).